Are humans meant to eat meat; not based on our anatomy and physiology! This is a simple answer to the question are humans meant to eat meat and that answer is no. We will explain all the reasons why animal meat was not meant to be a part of our diet. What is our diet? What is our food? Those are fundamental questions that we will answer for you. There is something called anatomy and physiology which we will expand on below. There is also something called form and function. Here’s an example of what form and function mean. Look at a bird flying. It’s able to fly because it has wings and hollow bones, form, and function. A Cheetah has four legs that allow it to run fast. A fish has gills that allow it to breathe underwater. Again, an example of form and function. Form and function is anatomy and physiology. Our physiology is a consequence of our anatomy. Our anatomy is necessary for our physiology. A part of our anatomy defines what we should eat. 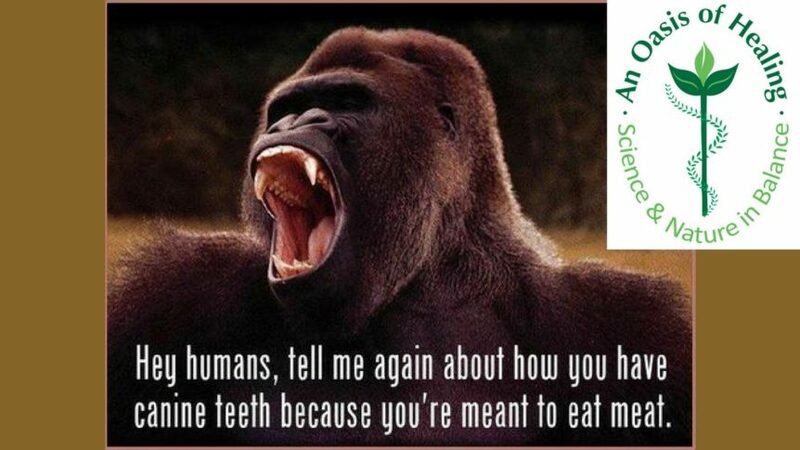 When we look at animals that are designed to eat other animals, their jaws only move up and down. These animals have no cheeks. Lions and dogs have no cheeks. Their lips are thin and their tongues are long and thin. All their teeth are sharp including their molars and their saliva is acidic. Their digestive tract is very short and straight. When animal flesh, either dead or alive, is eaten, it putrefies very quickly. In other words, it decays very fast. You have to be able to get this out quickly and that requires a short digestive tract. These animals can kill with their teeth and claws. All omnivores have a snout. A bear is an omnivore. In fact, a bear is 90% vegetarian, but it’s equipped to eat animals if it has to. A pig, dog, and rat are all examples of an omnivore. Omnivores can eat almost anything. In comparison, when we look at the animals that were designed to eat plants, their jaws go side to side and they have cheeks. Why do they have cheeks? Well, if your jaw is moving side to side, to allow for the grinding of the plants. These animals, like a cow, horse, and elephant, have thick tongues which are the first part of digestion. They also have a long digestive tract. The tongue is part of the mechanical breakdown of food. The cow, horse, and elephant all have flat teeth, they are not pointed. Humans don’t have teeth or hands designed for killing an animal. We can’t stop and pick up a wild boar and bite it to kill it. Humans were not designed for this. Humans are hunters and gatherers, sure, we hunt and gather fruit and vegetables. Humans hands were made for plucking and planting for caressing, loving, making music and loving. Humans are not good at killing. If we wanted to kill something, we make a tool or a weapon to do it. We are not equipped by nature to murder. We have to go out of our way to figure out a way to kill something. Humans do not look at a cow or pig walking by us and lick our lips thinking, yum, looks delicious. We even like to change the names of the animal’s people eat to beef or pork from cow and pig. Have you ever seen a beef or a pork walking by? We have to fool ourselves and change the name from a cow to beef or a pig to pork in order to eat it. We say, “I’m eating a steak versus saying I’m eating a dead cow”. Studies have shown that vegans and vegetarians don’t get heart disease or strokes, people who eat meat do. We teach people how to live in health by eating a whole food plant based diet!